As reported by Sudhir Gandrota. October 2, 2019. Hisar, India. The decision to spread further Mahatma Gandhi’s message of non-violence to the world coincides with Mahatma Gandhi’s 150th birth anniversary, with the second World March for Peace that will take place from October 2, 2019. As announced by Dr. Yogendra Yadav, convener of the Humanist Movement and of the World March for Peace, the 2nd of Octobers 2018 is of special significance because it is the 150th death anniversary of Mahatma Gandhi and it is celebrated as the International Non-Violence Day. 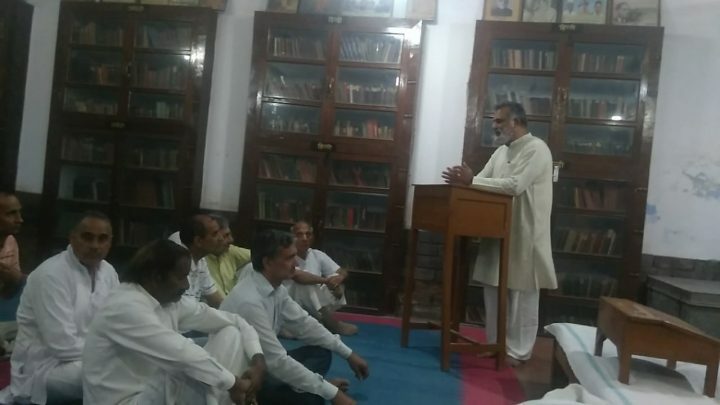 On this occasion, the Humanist Movement organized a meeting in Sarvodaya Bhawan and gave the call for the second World March dedicated to Mahatma Gandhi. The program was chaired by Swami Sahajanand Nath of the Humanist Movement, Hisar. On this occasion, he discussed the expansion of Mahatma Gandhi’s message and methodology of active non-violence, remembering Mahatma Gandhi on his birth anniversary. He said that the Humanist Movement also intends to move forward, keeping Mahatma Gandhi’s ideals as the central points to fulfill his incomplete dreams. When the World March team reaches Delhi, Swami Sahajanand Nath and other core team members from Hisar will join them for the journey onwards, guided by the vision that the next 10 years will be the years of change in this world for the establishment of world peace, in line with the objective of establishing the Universal Human Nation. The second World March for Peace and Nonviolence will begin on October 2, 2019, and end on March 9, 2020. It will go on for five full months, marching from Europe to Africa to America and then to Asia. On the 30th January 2020 it will enter India, the death anniversary of Gandhi Ji. The whole of the World March is dedicated to Mahatma Gandhi Ji. Today, the world has realized that it can survive only by establishing peace in the world and establishing a Universal Human Nation, surpassing the concept of national boundaries. Swami Nath noted that the Humanist Movement, established in the year 1969, completes its 50 years in 2019. He said that we have to overcome violence, both internal and external. The human development centers of the Humanist Movement are working for personal transformation, learning how to live the life of nonviolence. Simultaneously, the activity of bringing the world closer based on love and peace among all the nations, goes on. All these activities have a key role in the Gandhian thought and the Gandhian memorials. He informed that the humanist organization, World Without Wars and Violence formed in 1994 also completes its 25 years in 2019. It organized the first World March that started from Wellington, New Zealand on 2nd of October 2009, passed through 92 countries and completed its journey on January 2, 2010 in Punta De Vacas, Argentina. The objective of the World March was to call for the need to establish peace in the world and to explore the possibilities of a world without wars. Its central tenet is, “Nothing above the human being, and no human above another”, emphasizing the equality of all human beings across the whole world. The Humanist Movement aims towards the establishment of a Universal Human Nation, where anyone can live freely, and without fear. Silo, the founder of the Humanist Movement, pointed out and started efforts to stop this trend of growing violence and conflicts fifty years and its destructive effects is all the more evident to all now. This happened during the dictatorship in Argentina when the government did not appreciate such statements, and he was banned from speaking for a period of 12 years. Many were expelled from the country, but when a man realizes the values and the meaning of life, he moved ahead with strong determination. He founded the Humanist Movement on 4th May 1969 with the core concept based on active non-violence. It is important to know that Mahatma Gandhi was the first person in our world who opposed the government with non-violence. But, today, the Indian government is talking only about his message of cleanliness, which seems to be an effort of denigrating the Mahatma. Silo went on to unite the world in a nonviolent way. Nonviolence is the tool of determination and strong men while weaker people resort to weapons of war to spread violence. Many nations have become strong with armaments, with the number of weapons and money that has power affecting the survival of humanity. In 2009, the first World March for Peace was organized by the organization, ‘World Without Wars and Violence’ aspiring for a war-free world. Thinking that if there is a need to establish peace in the world, then there must be a big action at the world level. In 2012, the UN gave official rights to build a war-free world. 122 countries out of 130 signed the Nuclear Polarization Treaty, indicating that many countries of the world do not want war. The craving for war is in those nations who wish to establish their violent controls on other countries by force and money. So, we realize that the human race and peoples of the whole world are in trouble and in danger. After 10 years, we are here to give another call for Peace and Non-violence through the next World March for Peace. This March will begin on 02 October 2019 completing its journey on 8 March 2020, passing through 50 countries, starting and concluding in Madrid, Spain. On this occasion, Swami Sahajanand Nath said that when human being connects with his fundamental values, he starts on the path of Nonviolence. We all know the limitation of our life-spans and in view of it, we need to understand Mahatma Gandhi’s message of Nonviolence, leading a life of selflessness and love. For the safeguarding of human life, it is essential that we lead a life of non-violence towards everyone and every being. Aside from Dr. Yogender Yadav and Swamy Sahajanand Nath, Dr. Mahender Singh, head of department of History from D.N. College, social worker Shri J.D. Chawla, Shri Priyavrat Shastri, coordinator of Sarvodaya Bhawan, Professor Rajesh Jakhar, Madhusudan Patil, Bani Singh Jangra, Educationist Hoshiar Khan, Krishan Kumar, and others were present during the launching of the 2nd World March for Peace in India.